If you have an AirPrint-enabled printer, printing on the iPad should be as easy as one-two-three. Choose Print, and Select Printer if your printer isn't already selected. The iPad should transmit the print job to the printer and you should be good. But unfortunately, it doesn't always go that smoothly. If you can't print or if the iPad can't find your printer, there are a few things we can try to fix the problem. 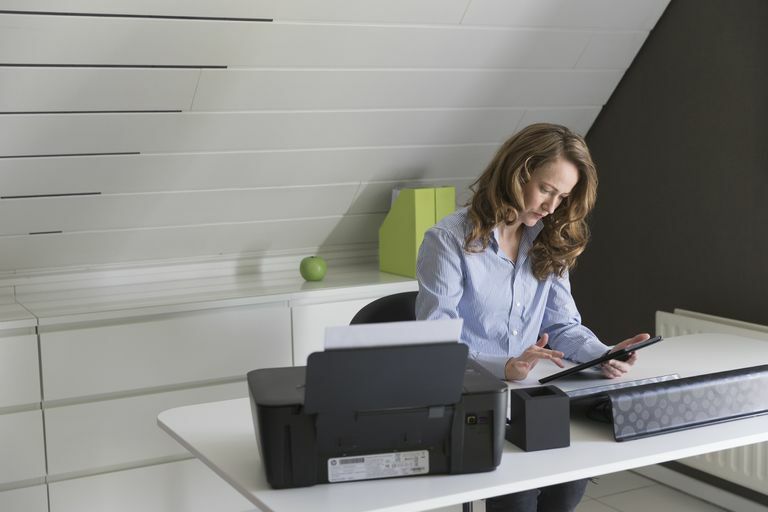 The most common problem is the iPad not finding or recognizing your printer. After all, if your iPad can't find your printer, it can't print to it. The root cause of this issue is that the iPad and printer are not communicating with each other correctly. I've found some printers, especially early AirPrint printer, are simply a little finicky and require special treatment from time to time. Make sure your printer is turned on. It might sound simple, but I can't count how many times I've tried to print a document only to find the printer - which is located in a different part of the house - was turned off at some point. Verify that you are connected to the right Wi-Fi network. AirPrint works over Wi-Fi, so if you are connected to the Internet via 4G, you won't be able to print to your network printer. Not only do you need to connect through Wi-Fi, but it should be the exact same Wi-Fi network as your printer. Most homes only have one Wi-Fi network, but some routers broadcast on a 2.4 GHz network and a 5 GHz network. And larger homes may have a Wi-Fi extender that broadcasts on a different network. You will need to ensure both the iPad and printer are on the same network for AirPrint to work properly. Refresh your Wi-Fi connection. This will force the iPad to look for the printer again. To refresh Wi-Fi, open the iPad's settings, tap on Wi-Fi in the left-side list, and tap the green switch to turn Wi-Fi off. Leave it off for a moment then turn it back on. Once the iPad connects to the network, try printing again. Reboot the iPad. It is surprising how many random problems simply rebooting the iPad will solve. The only reason why this isn't first on the list is that many of the other steps here are so quick to check. Hold down the Sleep/Wake Button until the iPad prompts you to slide to power off and then slide the button. After it is powered down, hold down the button again to power it back on. Reboot the Printer. Instead of being a problem with the iPad, it could be a problem with the printer. Powering down the printer and powering it back up again could correct problems on the printer side. Remember to wait until the Printer has reconnected to the Wi-Fi network before testing it again. Most AirPrint printers have a Wi-Fi light or icon on the display to show that it is connected properly. Verify it is an AirPrint printer. If this is a brand new printer, you will want to make sure it is an AirPrint printer. It should say that it is compatible with the iPad on the packaging if it is AirPrint enabled. Some older printers use a specific app to print from the iPad, so refer to the owner's manual. You can get a list of AirPrint printers from Apple's website. If this is a new printer and it is not AirPrint enabled, I'd suggest exchanging it for one that will work with your iPad. If you can see the printer on your iPad and send print jobs to the printer, it is probably not an iPad issue. The iPad should detect standard problems like the printer being out of paper or out of ink, but this relies on the printer to communicate back with the iPad. Check Ink Levels and Paper. The printer should normally have an error message if it had any problem with the print job such as being out of paper, ink or having a paper jam. Reboot the printer. Any number of things could have gone wrong on the printer's side, and simply rebooting it can cure these issues. Power off the printer and leave it off for a few seconds before powering it back on again. Once it has booted up, try printing again. Run diagnostics on the printer. Many printers have an option to run basic diagnostics. This would check for ink levels, paper jams and other common issues. Reboot the iPad. The problem shouldn't be with the iPad if the printer is showing up on it, but before we go further, we should go ahead and reboot the iPad. Hold down the suspend button until the iPad prompts you to slide to power off and then slide the button. After it is powered down, hold down the suspend button again to power it on again. If that doesn't work, you may need to try some iPad troubleshooting steps. Reboot the router. The problem might not be with the printer at all. If you've checked everything on the printer, it could be the router causing the issue. You can turn the router off for a few seconds and boot it back up again to see if that solves the issue. Remember to warn everyone in the household. This will bring down the entire Wi-Fi network while you reboot it. Contact the printer's manufacturer. At this point, we've gone through the basic troubleshooting steps, including rebooting the iPad, printer, and router. To get more specific troubleshooting steps, you will need to contact the printer's manufacturer. Can My iPad Use My iPhone's Data Connection?